Happy Friday! 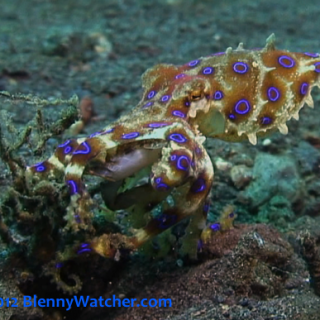 Blennywatcher is on the road, so I’m sharing some amusing marine life encounters from the archives. 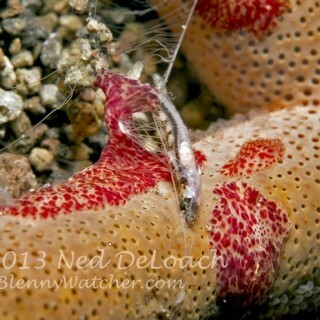 We don’t seek interactions with fish and critters – sometimes they just happen. 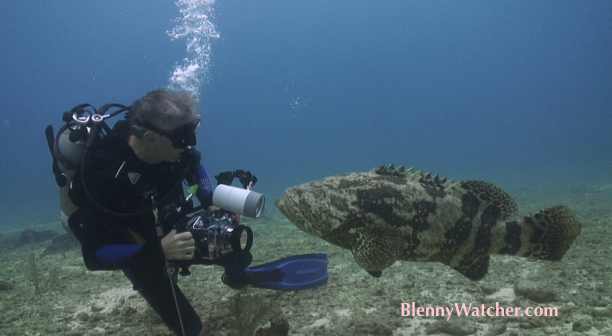 The Goliath Grouper, hanging out in an area where some dive operators fed fish, stalked us, hoping for a hand-out. 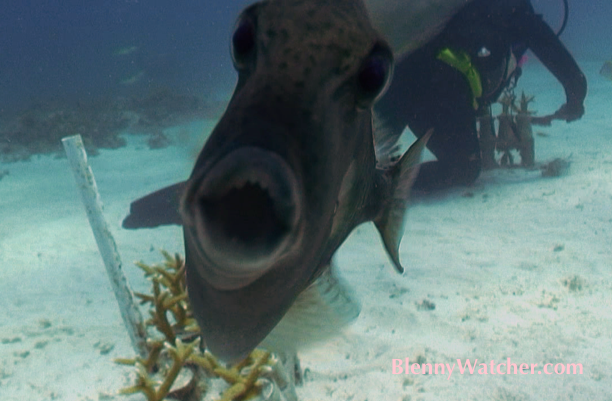 The head shaking behavior, shown in my video at the end of this post is interesting because a friend showed me similar footage of a grouper in Bonaire, where we are pretty certain fish were not being fed. 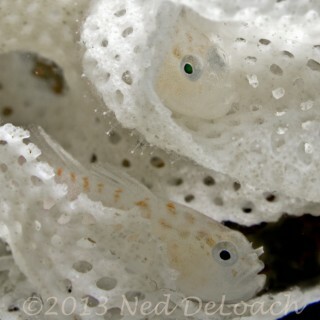 We spent a couple of days working in the Coral Restoration Foundation’s coral nursery in Key Largo. 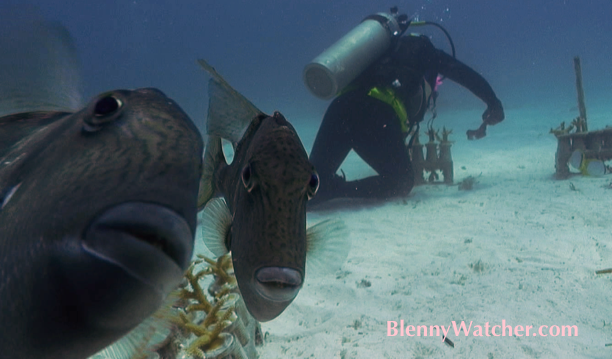 Divers cleaning algae off the bases attracted a lot of wrasses and other opportunistic feeders but the triggers were way more interested in my camera port. Ken Nedimyer said they were actually biting some of his volunteers. Uh-Oh … Looks like trouble. 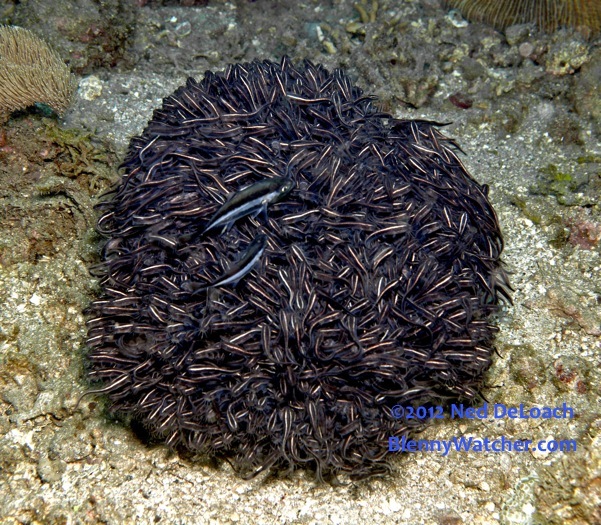 Back in 1995, we spent weeks in the same grass bed in Bimini, documenting the behavior of a colony of pikeblennies. A remora, a.k.a., sharksucker greeted us every day as we descended. We call them “sneaker heads” because the suction disk on top of their heads look like the soles of our shoes. 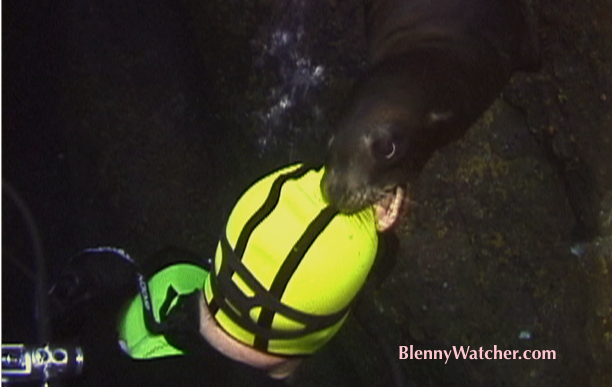 This one was quite annoying, sometimes boldly chowing down on my ponytail (one of the reasons I started wearing a hood). These are delightful Anna! 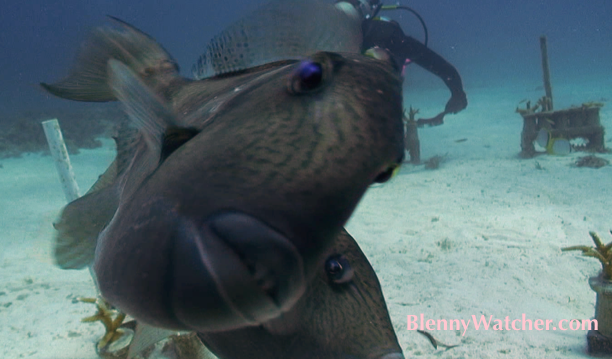 The sharksucker incident reminded me of the same thing happening to me and Brenda Hite last year in Little Cayman – as we were surfacing a 3+ footer would NOT leave us alone! He kept going back and forth between the two of us, no matter how many times we tried to fend him off. Wish you were there with your camera, it would have been hilarious video I’m sure!